A Superstar In China, Daniel Wu Emerges In His Native California The Chinese-American actor became an action movie mainstay abroad over the last 20 years. 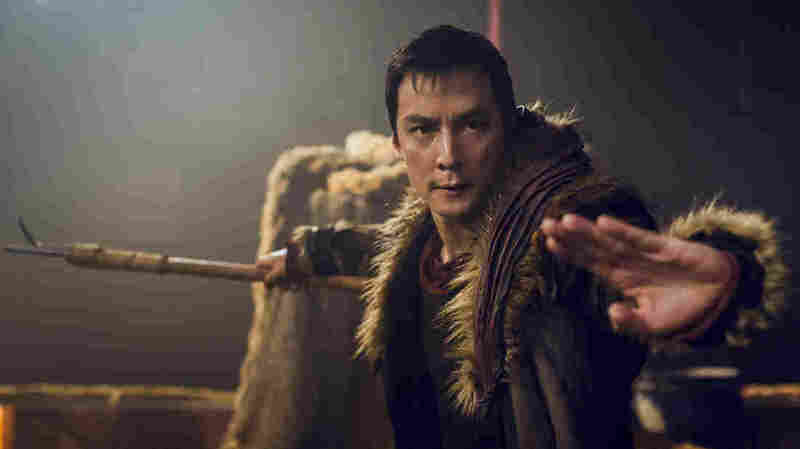 Thanks to his leading role in the TV series Into the Badlands, he's finally getting noticed in the U.S.
Daniel Wu plays the starring role in the TV series Into the Badlands, and also serves as one of its executive producers. In the dystopian AMC television action series Into the Badlands, Daniel Wu stars as a lethal warrior on a quest to discover the truth about his past. Over two decades, the 43-year-old has played leading roles in everything from romantic comedies to kung fu costume dramas. He's become a celebrity across Asia. But Badlands is the first starring role in the United States for the California native. "As a kid growing up in the '70s, '80s, as a person of color, I didn't see a future for that," Wu says. "In my field, there was a roadblock. And so, I basically had to go to Asia and get successful there in order to come back here to have success here." This year, Hollywood blockbusters like The Mummy, Ready Player One and Transformers: The Last Knight have done better box office numbers in China than they have in the U.S, according to IMDbPro's Box Office Mojo. That's part of the reason why Asian-American actors are starting to snag more leading roles in U.S. films like Crazy Rich Asians and in TV shows after decades of being sidelined in this country. Daniel Wu is one of them. Wu grew up in the Bay Area, the son of immigrants from Shanghai. He went to the University of Oregon, and thought he'd become an architect. But in 1997, after graduating, he traveled to Hong Kong, where he was randomly spotted in a bar by a talent scout for a TV commercial. It just so happened that Hong Kong film director Yonfan caught the ad — and gave the chiseled 20-something his first big break. The director tapped the novice to star in Bishonen, his drama about an ill-fated gay romance. But there were some challenges. "I've never acted before," Wu says. "And my Cantonese was not good at the time. So I turned it down." "By the end I was like, 'OK, if you don't blame me for screwing it up, I'll give it a shot,'" Wu says. That was the start of Wu's fast rise to stardom in China, though it didn't exactly happen overnight. "I came to Hong Kong as a foreigner," he says. "Even though I'm the same skin color, same hair color, same culture, I was treated differently at first." It took a couple years, but Wu says he was welcomed. "These are my people, my own culture, and they're accepting me," he says. "I think that's the most touching thing that's happened to me." Over the years, Wu says he returned to the U.S. for occasional, mostly disappointing, meetings with movie executives. "They don't really know what they're looking for," he says. "They're just looking for someone Chinese, you know, or Asian." But slowly Wu started to find opportunities. There was the American-Chinese co-production The Man with the Iron Fists, shot in China by the rap artist and and movie director RZA, who cast Wu in a small role. The RZA says he was surprised when his local crew saw Wu as the biggest celebrity on set. "I'm telling you, nobody gave two cents' s*** about none of us," RZA says. "When Danny came on the set, everybody went crazy. And all of a sudden, I was making a movie." These days, Wu is spending more time in California with his family. And after two decades of superstardom in China, Wu has finally landed a major role in the United States. "It wasn't until Badlands came about that I really kind of moved back here, because there's a steady strong job," Wu says. He trains at a gym near his home in Oakland. He needs to stay in shape for Into the Badlands ­-- where he says he's been in more than 30 fight scenes in three seasons. Wu says while he and a few fellow Asian-American actors are starting to get more lead roles in the U.S., there's still plenty of room for growth. "It's still not at the point where I'd like it to be," Wu says. "But you know, I understand that it's a slow process. It's a transition."